For as long as I can remember, I thought about what was next — how hard I was going to have to work to get from here to there and if I could only just make this one thing happen, then I would be happy… Then I could slow down and enjoy things. It was an insane way to live and I ended up missing out on a lot because of it. By the time I graduated college, I had worked for a few of the biggest names in sports, a newspaper in a top ten market and got a job right out of school — something most people dream about. A few years into it, I got burnt out. I lost my passion and myself. All the years I spent climbing a ladder that was leading me further and further away from who I was. About that time, I got married and my husband deployed for the 4th time. I didn’t know how to handle the stress of him being in another war torn country, on the other side of the world for 7 months with barely any communication. I needed an outlet for all the worry that came along with being an infantryman’s wife. I needed a way to deal with not being able to talk to him or know whether or not he was ok.
Running became that thing for me – it was my outlet, my way of coping and, I believe, the one thing that really kept me sane through it all. It also gave me a lot of time to think — about my husband, about my family and about how my passions had shifted. I realized that there was more to life than a 9-5 and decided to leave my career and the life I had built for myself in Arizona to move to 29 Palms, CA. What people assumed would be my biggest struggle — no corporate offices or big time jobs — turned into just the thing I needed. 29 Palms is about as no frills as it gets and in the time I was there, I was able to unbecome everything Arizona had made me into. I found my way back to me. I ran a lot. Hiked a lot and spent as much time with my husband as I could. I started to realize that THINGS didn’t matter. As long as my husband was safe and my family was healthy, I didn’t need much else. 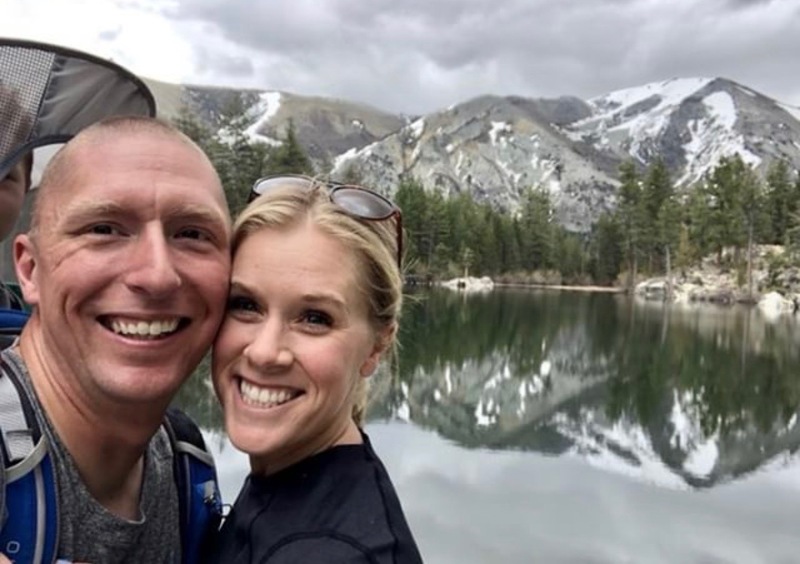 We’ve since been through two more deployments, the workups that went along with them,had our first child and moved to a place that’s even more remote and secluded than 29 Palms. This time in Coleville, CA where we’ve been able to explore all of what the Eastern Sierras have to offer. I’ve been doing a lot of running, a LOT of hiking and spending as much time with my son, my dog and my husband as possible. I’m working again, but my life is much more balanced. My passion is back and I’m sure as heck not going to miss out on anything anymore. I recently got the opportunity to collaborate with Chirag Patel for a photoshoot. Chirag takes the kind of photos that prompt you to stop scrolling through Instagram, pause and truly appreciate the talent it took to capture nature so beautifully. Chirag’s specialty is taking mesmerizing night portraits. 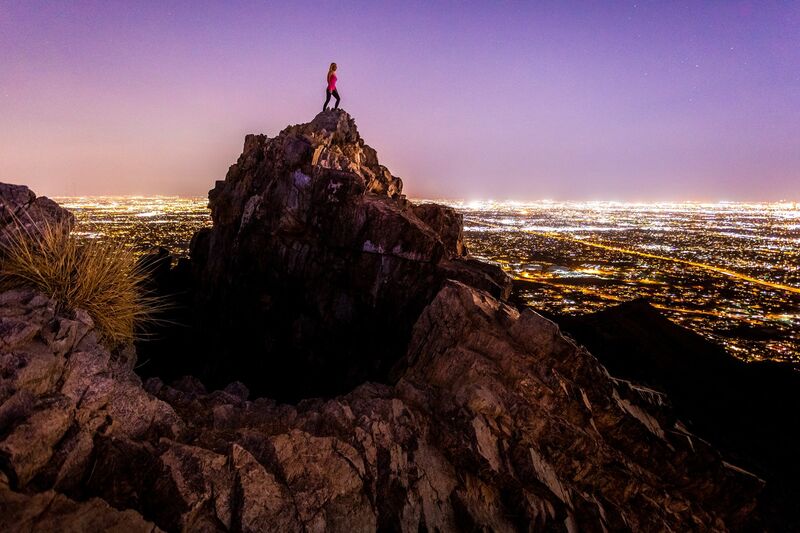 Check out some of the photos he took of me at Piestewa Peak. 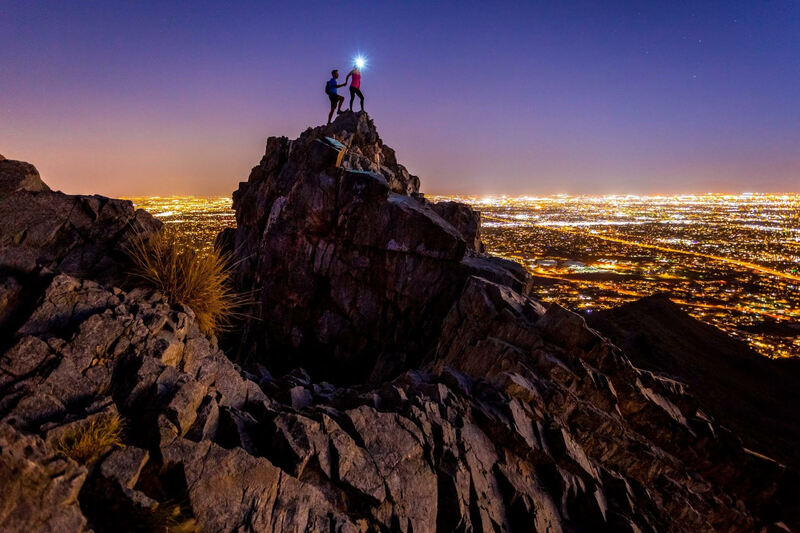 Night hiking is truly an experience unlike any other. At night everything is different…sparkly…magical! 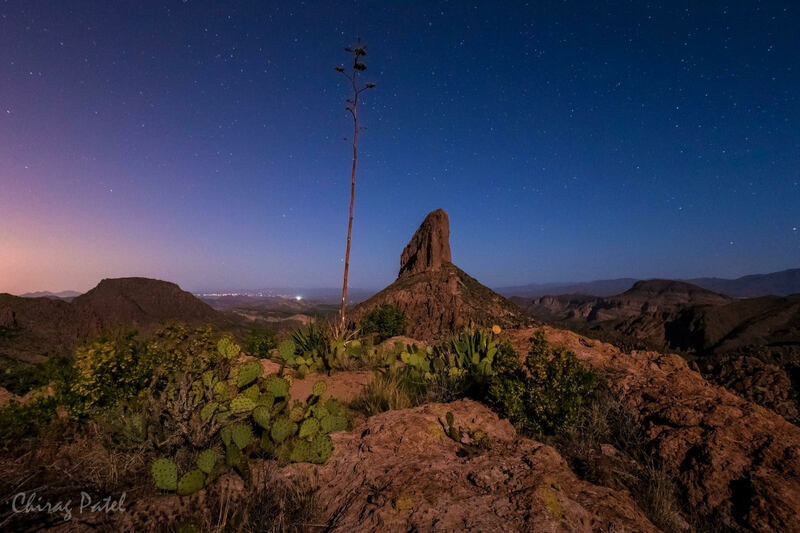 With it being dangerously hot during the day, it’s the right time to take up night hiking at trails that permit it. I’ll have details on which trails are open plus gear at the end of the post. Chirag is so comfortable night hiking, I wanted to share his story and advice with you in this interview. Kristen: When did you start night hiking? 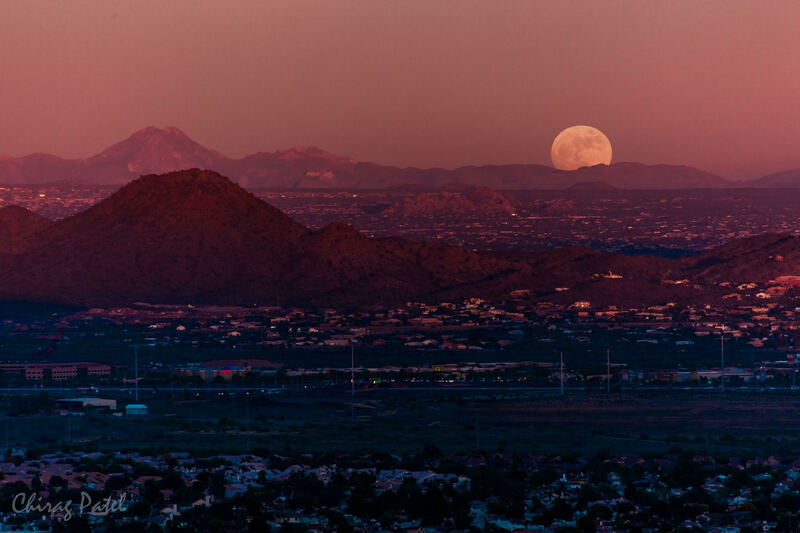 Chirag: I started night hiking accidentally a few years ago, when I used to hike up Thunderbird Mountain and Deem Hills at sunset to capture the Full Moon rising. After I would capture the Full Moon rise, I quickly realized that it was dark and I had to hike back down the mountain in darkness. It was a pleasant, surreal, and eerie experience at first, now it is an exhilarating experience. Kristen: What makes night hiking special to you? 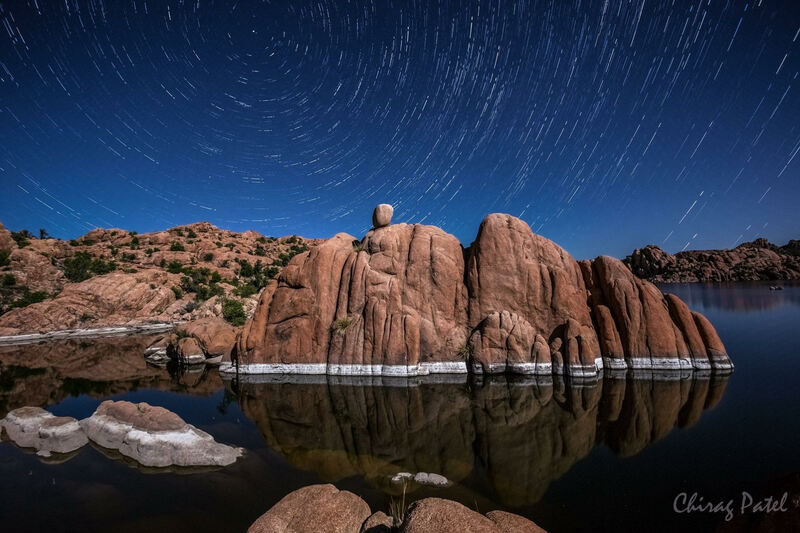 Chirag: Night hikes gives one a different perspective than the known daytime views. First thing to notice is the sunset and the changes in sky colors as the sun goes below the horizon. You will notice the beautiful Earth’s Shadow in the sky. 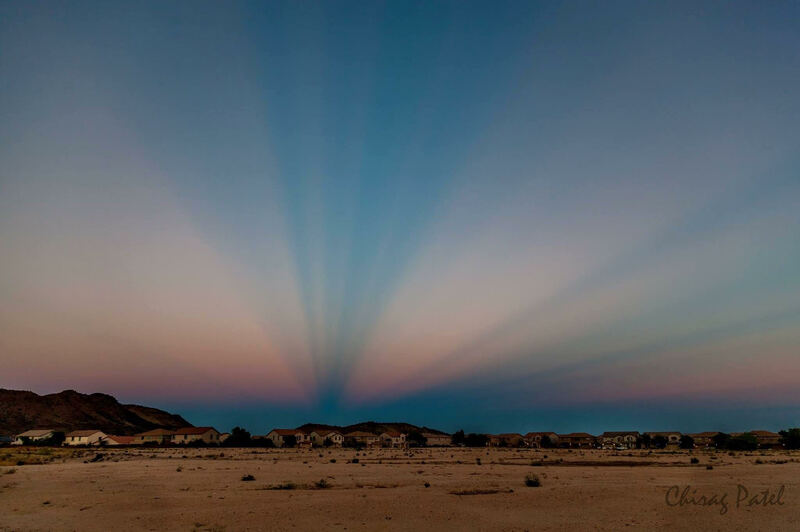 If you are really lucky, you may even see the Earth’s Shadow along with Anti-Crepuscular Rays as shown below. Chirag: As the sun goes down, one will also see the city lights come up tracing the popular streets of the city making them come alive with street lights and car trails. See below. Chirag: The views become really stunning and spectacular! Kristen: Where is your favorite place to night hike regularly? 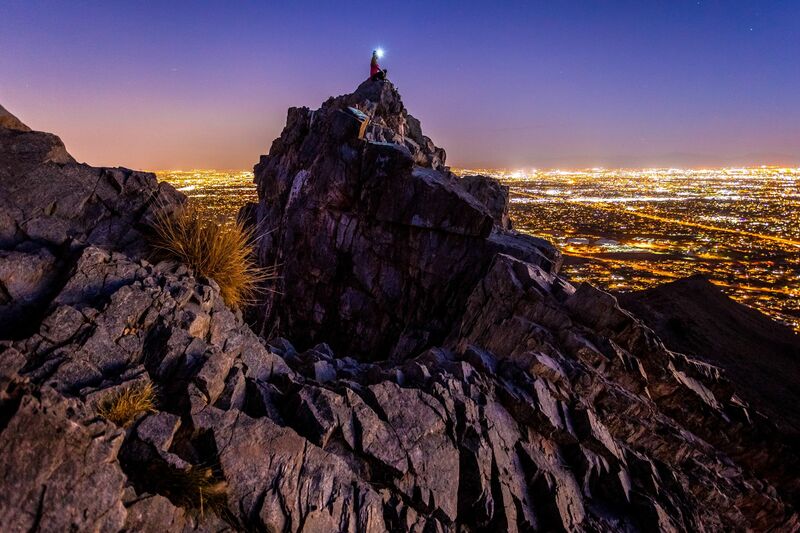 Chirag: My favorite night hike is Piestewa Peak using the Summit Trail to the top. Biggest reason is because it has the best 360° views anywhere in town and it is also the only place within the city where you can hike until 11 pm, legally! 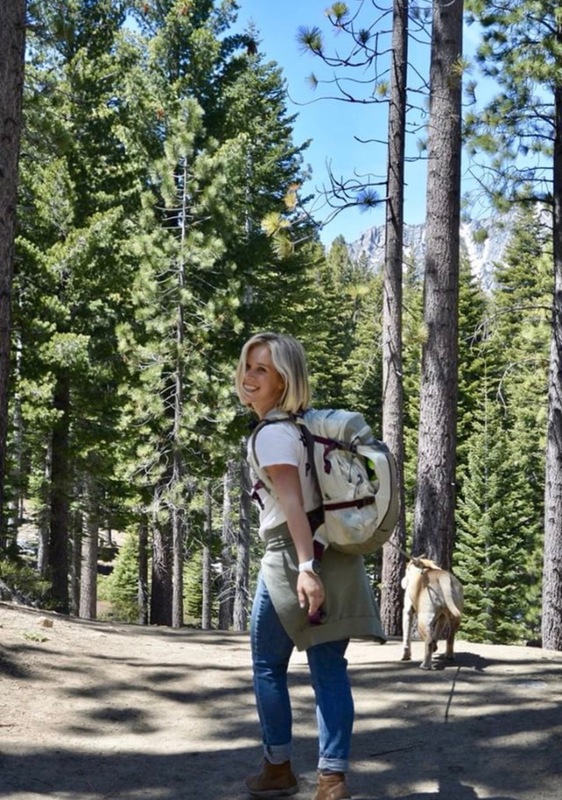 Kristen: What gear do you recommend for night hikers? Being in the desert, one must carefully select gear that is appropriate for the hike. In the summer, water and snacks are an absolute necessity! Not having enough water has caused many emergencies and could become very dangerous. I would also highly recommend headlamps, smartphone with maps, and even a light jacket in case it gets really cool after sunset. Kristen You’re an incredible nighttime photographer. Where are your favorite nighttime locations? 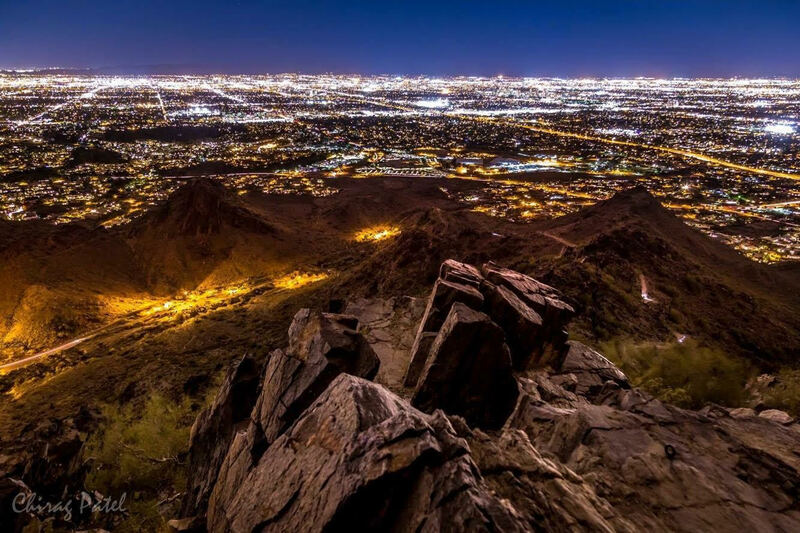 Piestewa Peak, for its incredible 360° city views. Kristen: What does it require to take great photos at night? Gear? Patience? Education? Taking photographs at night is a bit more challenging due to the lack of light. But, images can still be captured using long exposures to gather and capture the limited available light. To capture an image using long exposures requires a tripod and the use of high ISO and longer shutter speeds in the camera. There are lots of resources on YouTube teaching you the basics of long exposure photography. Kristen: You’re incredibly committed to your photography hobby. You even sacrifice sleep on Fridays! Talk about a memorable journey you took to get photos. Chirag: Because time is extremely valuable and has to be allocated appropriately between work, family, and leisure, time must be used wisely. Sometimes regularly sacrificing sleep one day a week to do some night photography and being with the family the by the time they wake up the next day. Thus, it has become normal for me to be up awake for about 36 hours in a row once a week. My typical Friday/Saturday consists of working all day, coming home for dinner with the family, hiking and photographing all night, and spending the rest of the day Saturday with the family. I finally sleep Saturday night after being up awake for 36 hours. Kristen: What would you say to someone who is nervous to try night hiking? Chirag: Your headlamps will make it seem like daytime on the trails! It is very comforting when you can see everything. Here is one available on Amazon that is rechargeable and extremely bright. I can’t thank Chirag enough for his photos and insight. Please give him a follow on Instagram. As of April, night hiking is now a regular hobby for me! I had a bad experience with buying a headlamp online so I highly recommend heading to see my friends at Just Roughin’ It Adventure Company in Scottsdale. They’ll also give you a ton of advice and answer your questions. Just Roughin’ It is a shop and a tour service so you’re talking to the experts! If you aren’t afraid of buying online and don’t want anymore advice, then check out my head lamp online. It is Black Diamond, a great price point and is very bright! Keep in mind, it’s cooler than daytime but if you’re night hiking from June- September it’s still going to be toasty so you need to bring just as much water as you would for a day hike. I also always bring a spare flashlight, snacks and a first aid kit. Watch out for snakes. As I embarked around sunset for my last night hike, a park ranger stopped to tell me a lot of rattlers were out and warned me to be careful. If you’re hiking with a pet, remember the temp has to be below 100 degrees to legally take them hiking in many areas so make sure the temp has dropped. 90s are still toasty for dogs. I only hike with Ace when it’s 85 or cooler. If your dog handles 90s, well definitely clip a light to them. Here’s one I like. 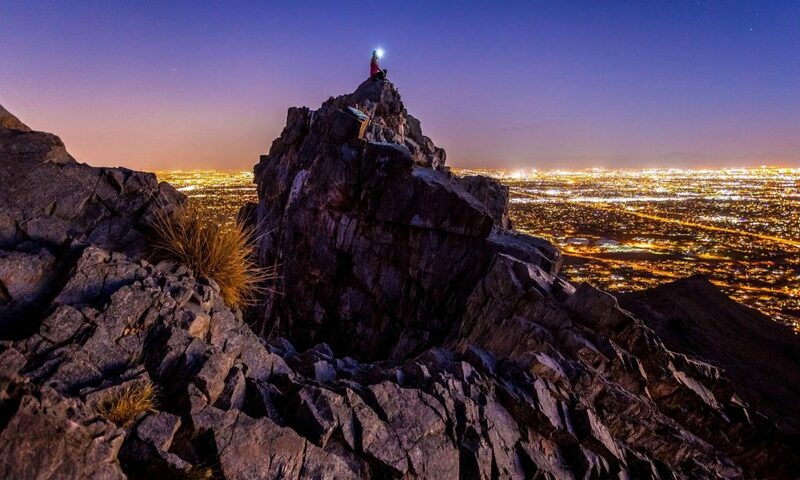 Let’s talk about where to go night hiking. You can’t just go anywhere. Try hiking at night at the wrong spot and your car will get towed! Here are some places where you can night hike but keep in mind the gate into the parking lots typically close at either 7:00 pm or 9:00pm and the gates to get out close at 10 or 11pm. It’s night hiking, not OVERNIGHT hiking. 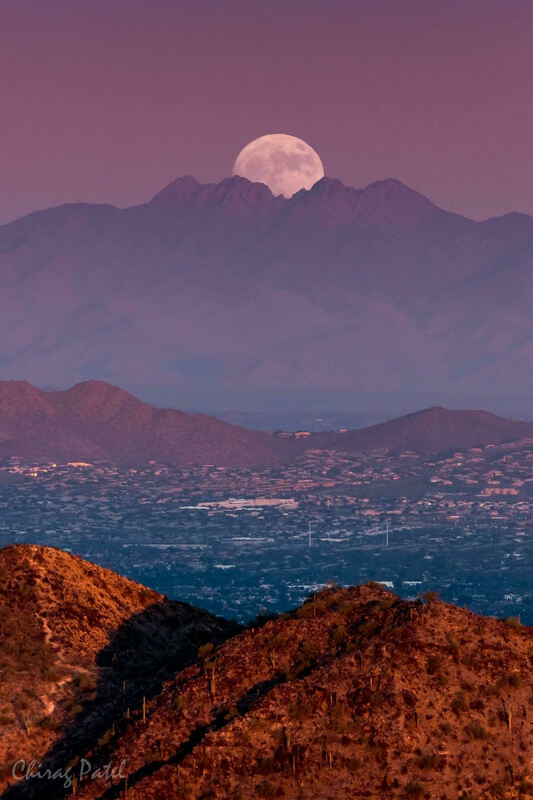 Note: Camelback Mountain closes at Sunset. Have fun, be safe and let me know how your night hike goes! Make sure you’re following me on Instagram. 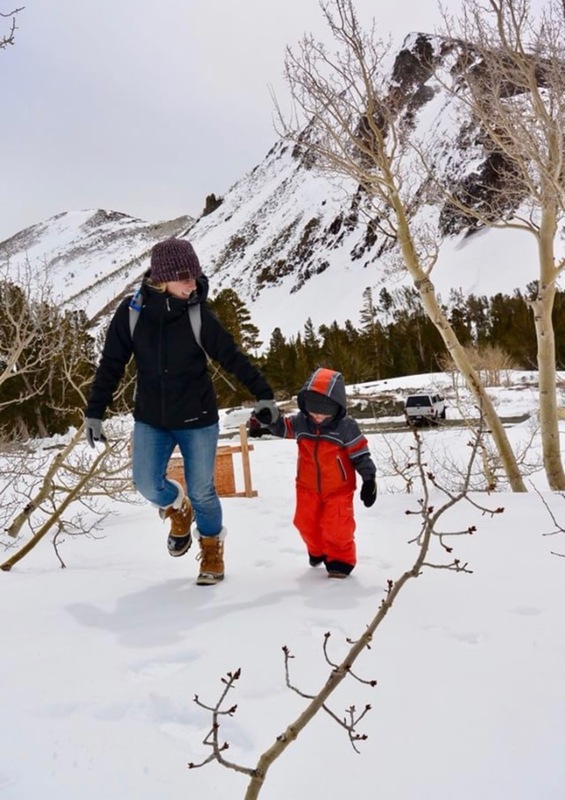 You may recognize Kristen Keogh from her 10 years in front of TV cameras, but her life began in a much different setting. Here with Her takes you on her journey to finding beauty and serenity. When she’s not working, Kristen can constantly be found on the mountain.